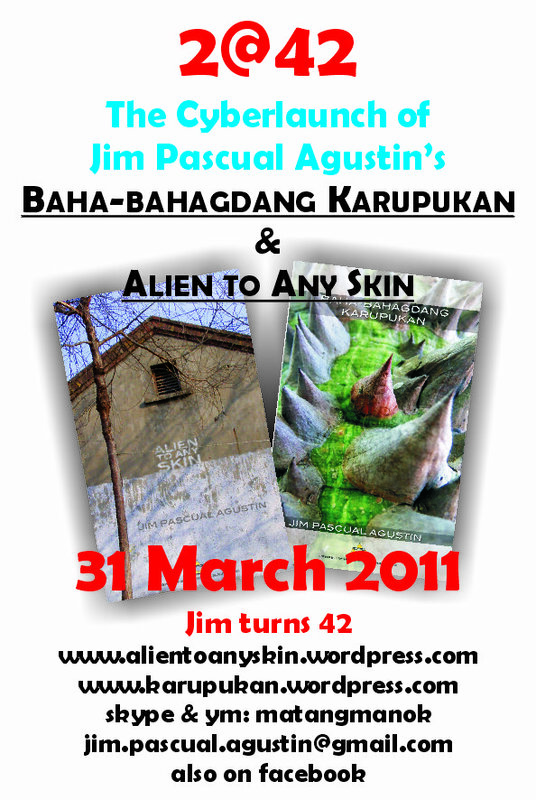 Jim Pascual Agustin celebrated with a cyberlaunch of his books last March 31, 2011. Based in Cape Town, South Africa for many years now, Jim has just released 2 books of poetry published by University of Sto. Tomas Publishing House (2011): Baha-bahagdang Karupukan (poetry in Filipino/Tagalog) and Alien To Any Skin (poetry in English) as he turned 42 this year. Poems of Jim can also be seen in Scribd.com. He hopes that one day (soon), he could launch the books in the Philippines where his offline presence is needed. You can also check out the blog sites of his 2 books: www.alientoanyskin.wordpress.com and www.karupukan.wordpress.com. You can also reach him thru Skype & YM: matangmanok or email him at: jim.pascual.agustin@gmail.com. sa sampayan ni Aling Sela. sa tutubing langit sa sampayan ni Aling Sela. Six in the morning, Yogyakarta. of the road, now just waking. His toes so round, so still. to his back with a red blanket. I am not from here. with the camera, with a finger, a request. And he nods. Gives an even wider smile. Years later I have these photos. The other of two different generations. while the rest of the world slept.